How to choose a TV Wall Mount? Most popular tv brackets systems. How to choose a TV Wall Mount? Before buying a TV wall mount, you should pay attention to a number of important details. First, сheck the characteristics of your TV: weight and size. You can damage your expensive 55 inches TV weighing 40 pounds if you install it on a wall mount that can withstand a TV sizing 32 to 50 inches and weighing up to 30 pounds. Before purchasing, check all the same specifications for the wall mount on its packaging. Next, check that the distance between the holes for screws on the back of the TV matches the distance between the holes on the bracket plate ( VESA ). The most TV brackets comply VESA so you shouldn’t actually worry about this. Think about what the bracket will be mounted to. Will it be a wall, two walls or ceiling and should the tv mount direction be adjustable to watch the TV in different positions. 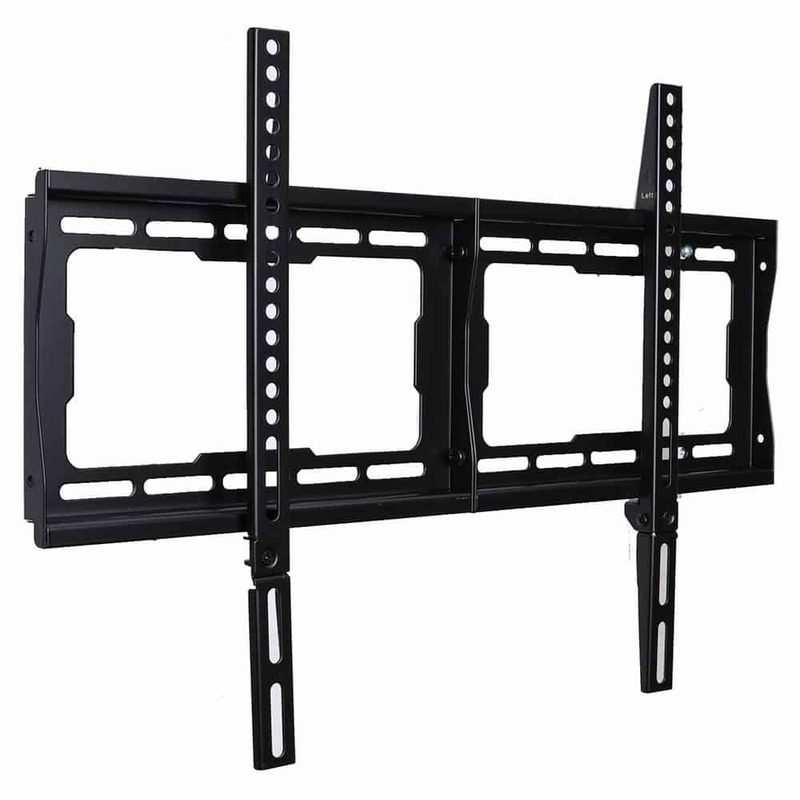 There are several types of TV wall mounts. Let’s consider the most popular of them. This method of mounting is the cheapest and easiest to install. The TV is placed at the closest possible distance from the wall, and you cannot change the position of the screen. This method is best used when the TV is directly in front of you, and the center of the screen will be located at eye level. See low profile wall mount on Amazon. 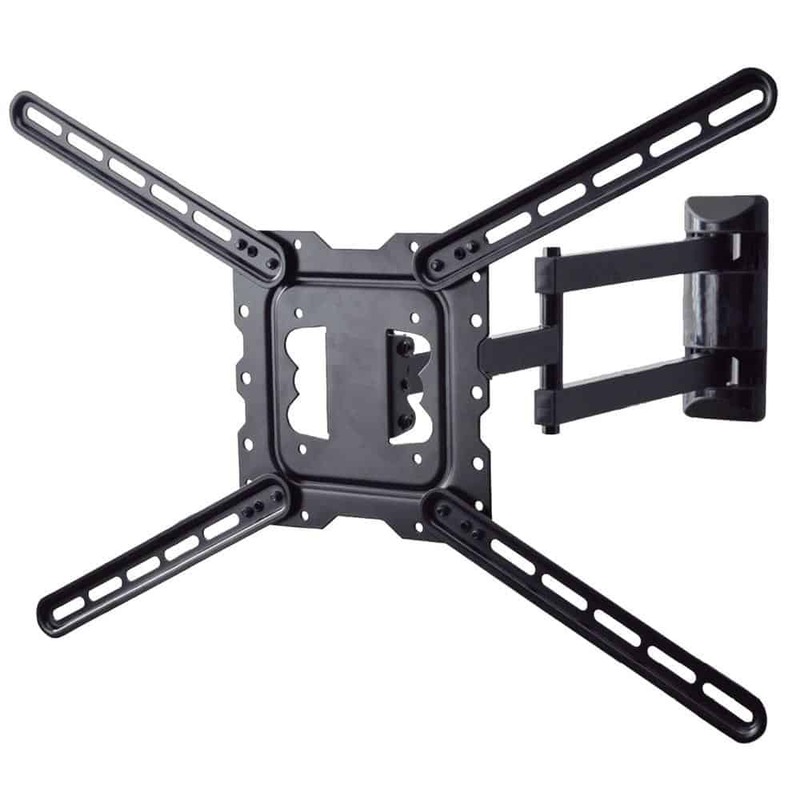 The principal difference between this type of mounting and the abovementioned is that the TV can change the viewing angle vertically, that is, it can be tilted down. 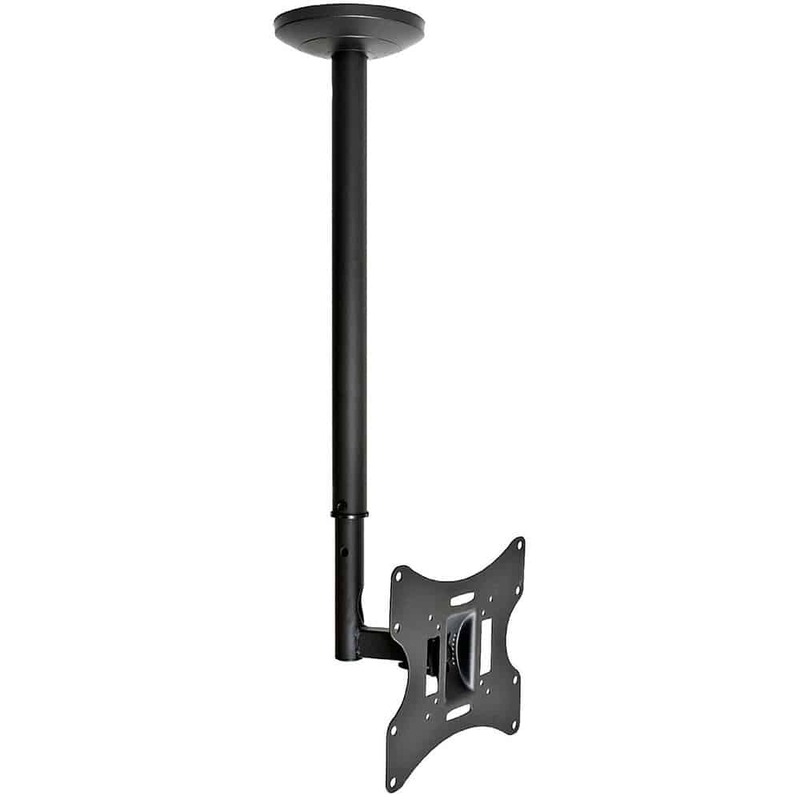 The tilt mount has hinges that allow the TV to change the viewing angle at a sufficient level. See tilting wall mount on Amazon. This type of mounting is the most functional, but at the same time, the most expensive. By installing the TV on this bracket, you will get the maximum possible movement of the screen in any direction by 180 degrees, which will make it possible to enjoy viewing from any corner of the room. See articulating wall mount on Amazon. 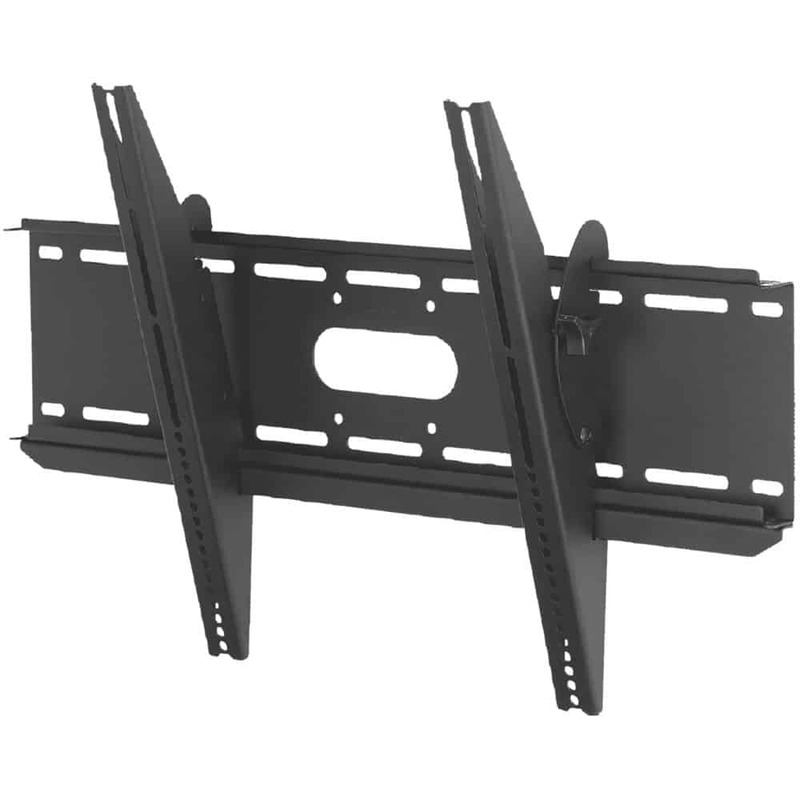 Articulating dual mount has similar features as a single wall mount an at the same time it better for plasma TVs which have high as well as it’s good for big size televisions with diagonal from 50 inches. You can find more features on the product page of dual articulating mount on Amazon. The advantage of this mounting is that it is fixed to the ceiling, and not to the wall. This will greatly facilitate the task of placing TV in the middle of your office, room, backyard or store. Also, depending on the mount model, you can rotate the TV in different directions from different angles. See ceiling mount on Amazon. 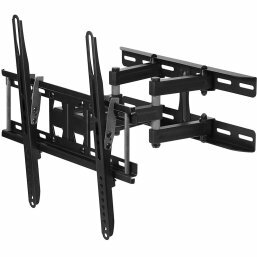 There are many types of tv wall mounts on the market now. You can find the one which will meet all your requirements. Finally, we would like to note that if your TV will be placed on the street and installed on the mount, then do not forget to put on the Outdoor TV cover, which is suitable for any type of mounting. It will prolong the life of your outdoor tv as well as tv mount service life. 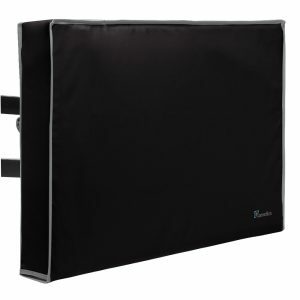 We manufacture all weather television covers which are specially designed to withstand harsh weather conditions all year round for TVs up to 75 inches in diagonal. 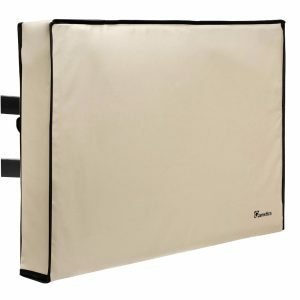 Keep the TV clean and dry and extend the life of your outdoor TV! Garnetics.com is a participant in the Amazon Services LLC Associates Program, an affiliate advertising program designed to provide a means for us to earn fees by linking to Amazon.com and affiliated sites.